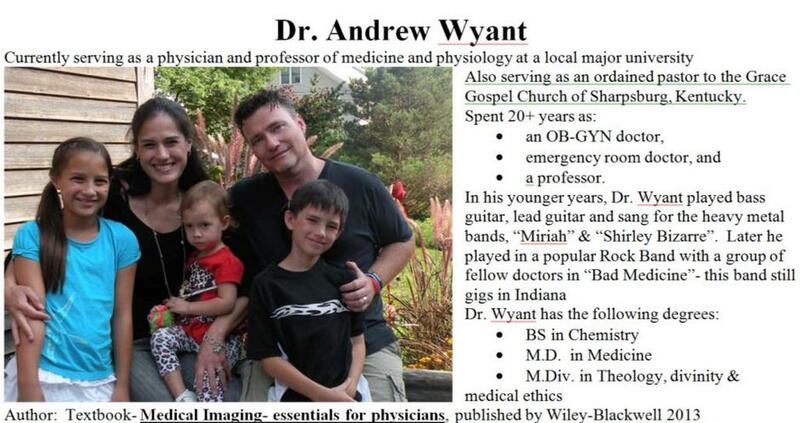 God-Talk.com is a presentation by medical doctor, Dr. Andrew Wyant, and rocket scientist, Douglas G. Thorpe. Meet the Hosts. Also serving as an ordained pastor to the Grace Gospel Church of Sharpsburg, Kentucky. 	Andy has been married to the beautiful Krystal Kama for 9 years. 	Andy is a medical doctor, a professor of clinical science, and a trained theologian- with all that school he is indebted to the Federal government but must have something to say. •	Mr. Thorpe has spent 30 years in the fields of mechanical, electrical, chemical, & general engineering. •	Most of his career has been in the aerospace & NASA, department of defense, and energy recovery industries. •	Mr. Thorpe holds many patents for internal combustion engines, electric motors, concrete building blocks, and others. •	Mr. Thorpe has published many technical papers in the American Institute of Aeronautics and Astronautics organization (AIAA). •	Please find and read Mr. Thorpe's technical papers, which can be found at the Space Propulsion Synergy Team website. 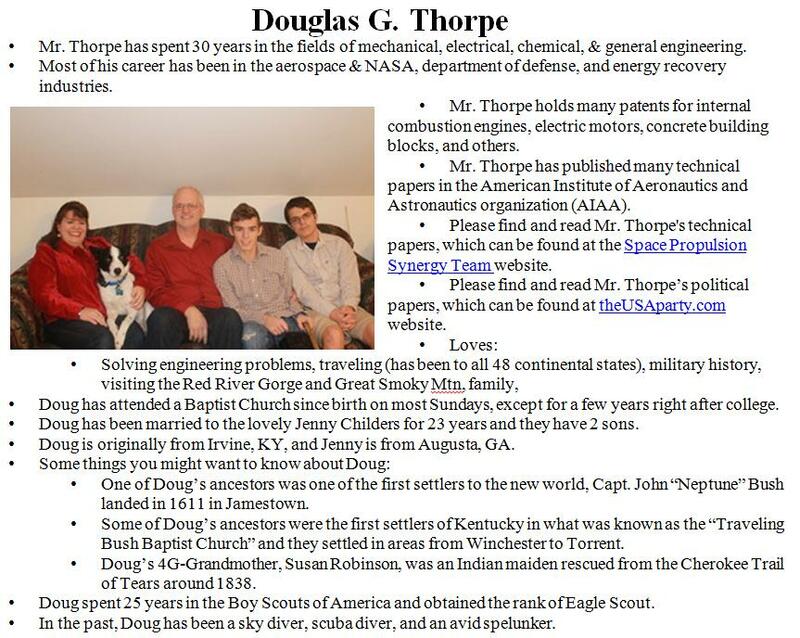 •	Please find and read Mr. Thorpe’s political papers, which can be found at theUSAparty.com website. •	Doug has attended a Baptist Church since birth on most Sundays, except for a few years right after college. •	Doug has been married to the lovely Jenny Childers for 23 years and they have 2 sons. •	Doug is originally from Irvine, KY, and Jenny is from Augusta, GA.
•	One of Doug’s ancestors was one of the first settlers to the new world, Capt. John “Neptune” Bush landed in 1611 in Jamestown. •	Some of Doug’s ancestors were the first settlers of Kentucky in what was known as the “Traveling Bush Baptist Church” and they settled in areas from Winchester to Torrent. •	Doug’s 4G-Grandmother, Susan Robinson, was an Indian maiden rescued from the Cherokee Trail of Tears around 1838. •	Doug spent 25 years in the Boy Scouts of America and obtained the rank of Eagle Scout. •	In the past, Doug has been a sky diver, scuba diver, and an avid spelunker.